Hellan Strainers remove all types of solids (such as algae, zebra mussels, sand, grit, debris, machine cutting chips etc.) from various fluids. They are extremely popular due to their reliability, efficient operation and cost savings. Instead of trapping solids like conventional basket strainers (which necessitate frequent basket removal for cleaning), the Hellan Strainer discharges solids from the flow without disassembly. This reduces operational and maintenance costs and permits continuous flow of fluids. In Line Flow Hand Operated Strainer Available in 2 1/2", 3", 4", 6", 8", 10", and 12" models. Type DH Hellan Strainers employ two hand wheel equipped rotating screens and rigid scraper bars to remove solids from the surface of the screen when the hand wheels are rotated. A solids collecting sump is also provided. Cleaning of the type DH is accomplished by opening a valve on the sump flush connection and rotating the hand wheels several times. The cleaning cycle must be performed when the strainer is under positive pressure. 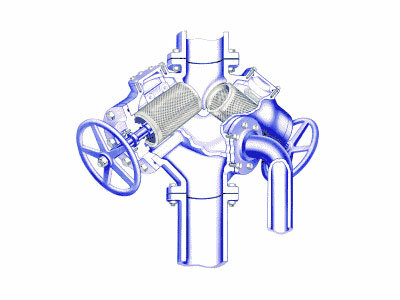 Type DH strainers can be installed in the vertical up-flow position or in the horizontal flow position with both screens in the horizontal plane, and sump flush connection preferably located at the bottom.